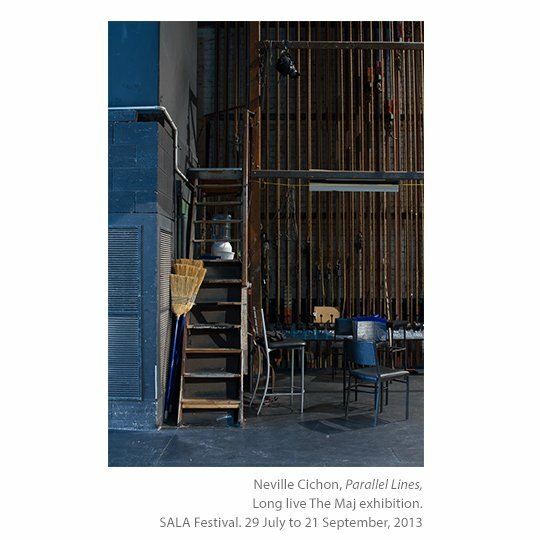 In February 2013 the backstage areas of the Adelaide Festival Centre and Her Majesty’s Theatre were unveiled through the Backstage Pass photographic exhibition that offered a rare insight into the nostalgia, humour and mechanics of our iconic performance spaces. 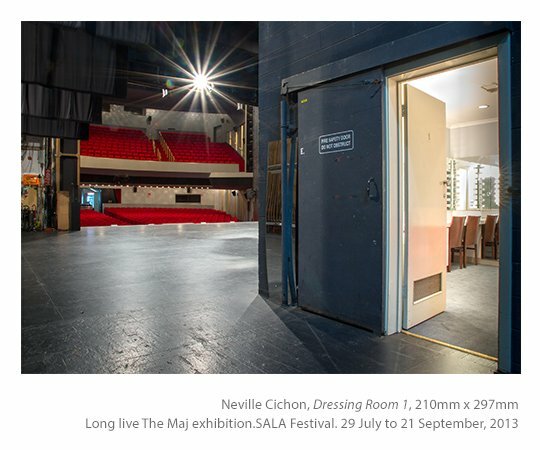 Over a two year period, Adelaide documentary photographer Neville Cichon walked the stages, greenrooms, corridors and catwalks throughout the Adelaide Festival Centre and Her Majesty’s Theatre to capture the rarely seen backstage areas for a photographic exhibition presented in the Festival Theatre foyer to celebrate the 40th anniversary of the Centre. 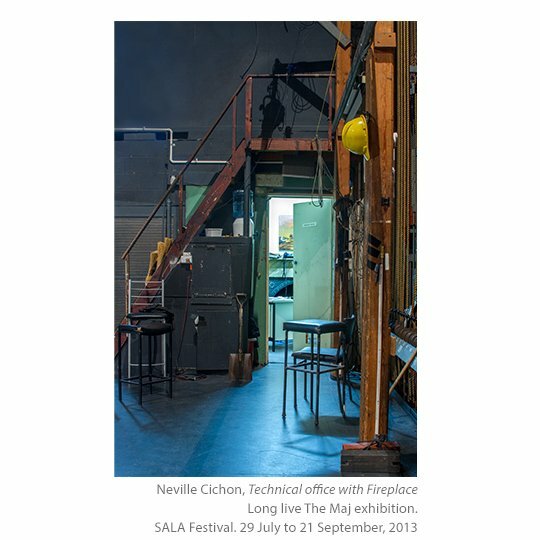 The exhibition featured various working areas throughout the theatre including the wings, green room and scenery dock. 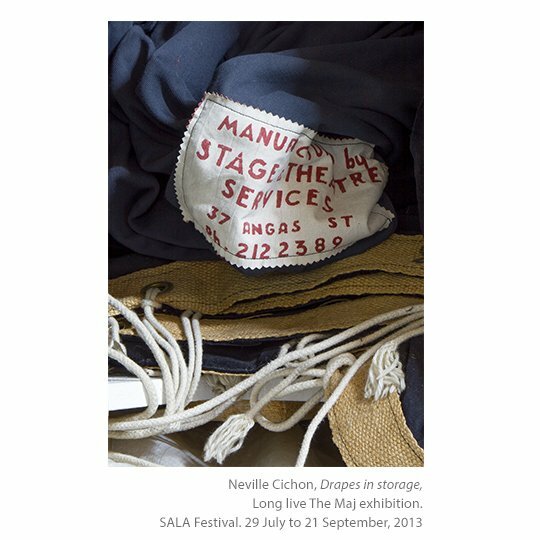 The physical age of the theatre is evident in the photographs as well as its long history of diverse theatrical productions. 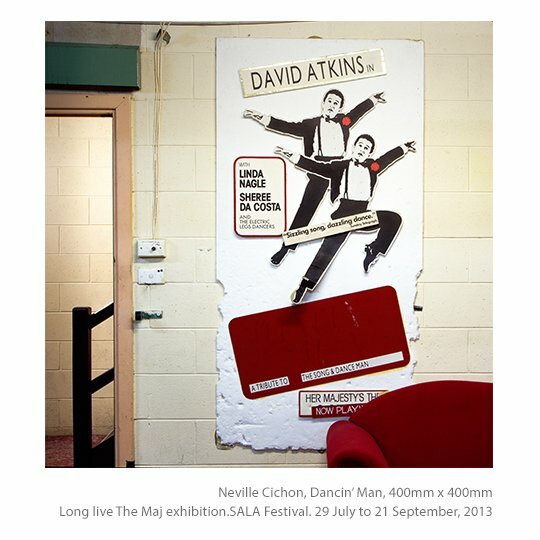 Spike Milligan and Dancing Man David Atkins made an appearance in two of the photographs. Long live the Maj revealed a unique workplace that has changed little in the last 100 years. 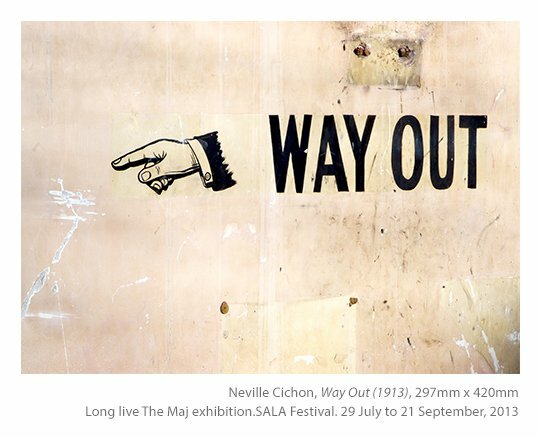 Some of the photographs are gritty and industrial, and a sense of the history materialises through the layers of marks and wear and tear. 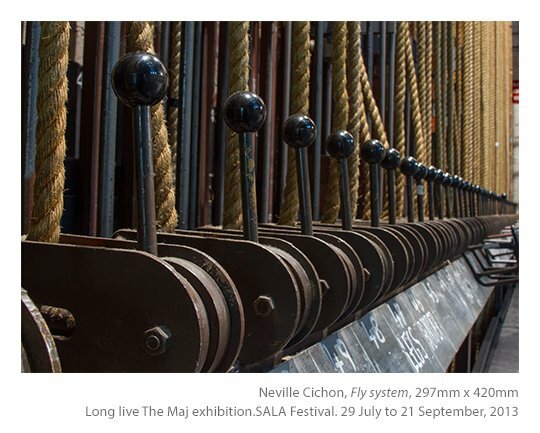 The exhibition was presented from July 29 to September 21 2013 in the Dining Room and Theatre Bar at the Hotel Metropolitan, right next door to Her Majesty’s Theatre in Grote Street, Adelaide. Read an article by Tim Williams (02/09/13) about the two nights of projections onto the side of the Theatre. Article with sneak peek photo. Read an article by Peter Goers: 100 years of memories at Her Majesty’s Theatre (01/09/13). 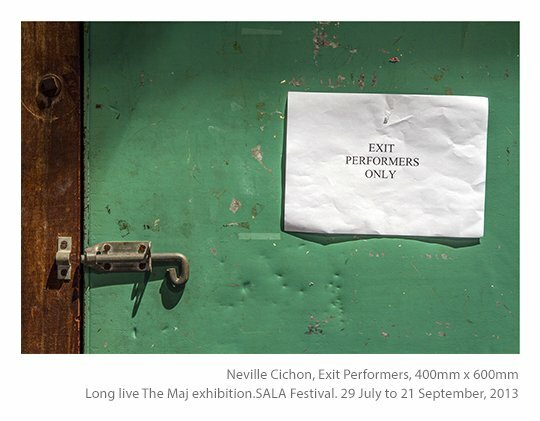 As Her Majesty’s Theatre prepares to celebrate 100 years in show business in September, this SALA photographic exhibition will reveal how some of the big names left their mark on this historic venue. ‘Spike while the iron’s hot!’ screams pink lettering from a tattered sticker on a locker in the Green Room. This was a souvenir of a tour to Adelaide by Spike Milligan in 1976. 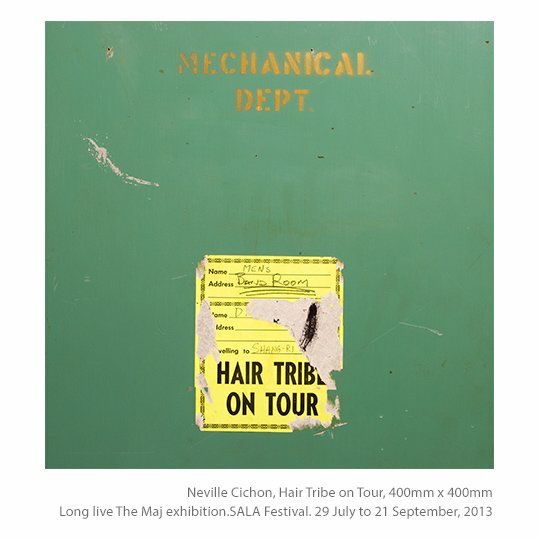 Adorning a door labelled ‘Mechanical Dept.’ is an even scruffier tour sticker from the 1972 production of ‘Hair’ featuring Reg Livermore and Marcia Hines. 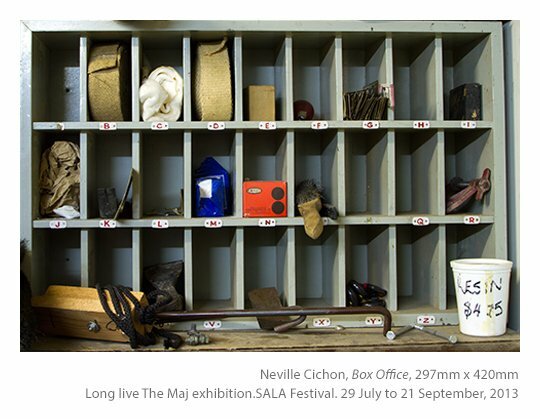 These are just two examples of the hidden momentos that will be shared for the first time in the ‘Long live The Maj’ exhibition at the Hotel Metropolitan, right next door to the theatre. 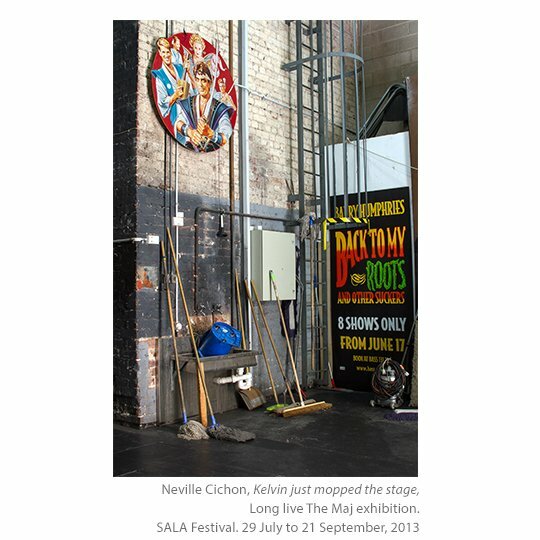 You will also see Dancin’ Man David Atkins striking a pose on the Green Room wall, as well as finding out how close Barry Humphries preferred dressing room is to the stage. The eastern wall of the wings with a staircase climbing above the Technical Office. This souvenir of the 1989 production starring David Atkins and Rhonda Burchmore adorns the wall in the Green Room below the stage. These were originally suspended across the top of the stage and blended with the gold tassels across the bottom of the house curtain when raised. 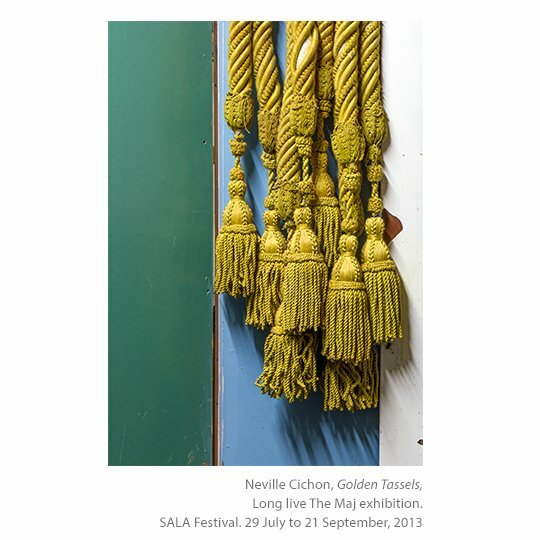 The hand-made double-tiered silk tasselled fringe was originally installed during a major renovation in 1962, and these now rest on the back of a door in a storeroom. When there were three levels of seating, instead of the two currently, this sign was up in the Gallery (top level). It still remains today on the western wall up above the existing ceiling. This chandelier is located in the main auditorium. 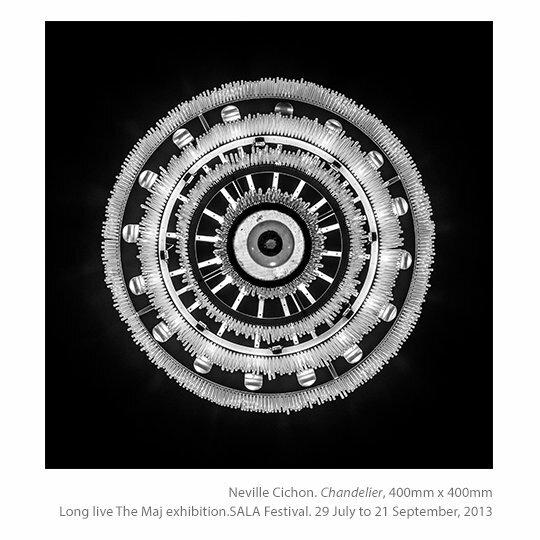 It is comprised of hundreds of glass tubes and was installed during a refurbishment in the 1970’s. Black drapes will always come in handy in a theatre. It is estimated that these were manufactured locally in the 60’s or 70’s. These pigeon holes were originally used in the box office to organise tickets in the middle of last century. They are now used to house a random collection of miscellaneous resources in a storeroom. The full title of the production is Hair: The American Tribal Love-Rock Musical, thus the reference to Tribe on the tour sticker that is still attached to a door backstage. The season that commenced in November 1972 featured a cast with Reg Livermore and Marcia Hines. 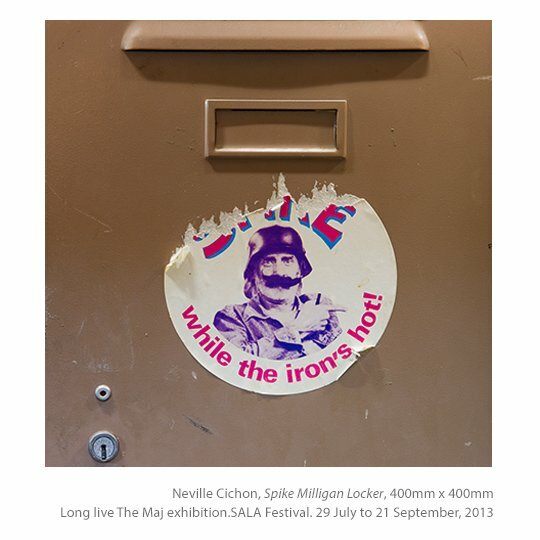 A tour souvenir sticker that was applied to the locker when Spike Milligan presented An Evening with Spike Milligan as part of the Adelaide Festival of Arts in March 1976. 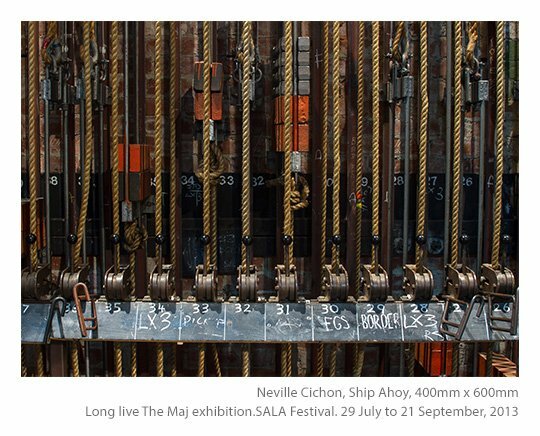 51 of the 83 ropes and levers along the eastern wall of the wings. The fireplace was acquired in 1991 when the English Shakespeare Touring Company concluded their Australian tour. The office is located in the north east corner of the stage, adjacent to Dressing Room 1. When Barry Humphries performs at his favourite theatre, this is his preferred dressing room. Close to the stage. The scenery dock with souvenirs from the Mikado (c1995) and Back to My Roots and Other Suckers (c2003). The fly system along the eastern wall of the wings. A door leading to the auditorium from the western wing of the stage.